Written just after Canada won the Gold Medal in Hockey at the 2010 Winter Olympic Games in Vancouver, BC. Monday: Today I am recovering from "Hockey Fever," like most Canadians. Today I feel wonderful. It has been a day to rest, think, and wonder. Nearly everybody is a bit surprised at the success of the past two long weeks, as I am. After all the competitors have done their best, and now, on their way home, whether they lost or won, they have done it all, with skill and love of sports. Congratulations! The biggest surprise to me is the very beauty of the Medals themselves, so very different in design, size, and shape. The Native couple of people who did them and in patterns, need a medal themselves. I really hope they both get a lot of recognition. 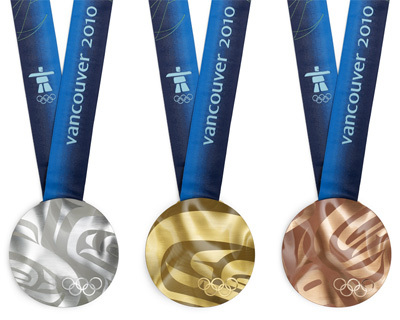 You can see the native designs on each medal. I could not find the reference, but I'm sure these designs are copyrighted by the Canadian Olympic Committee for Vancouver 2010. I think they are stunning.